Besides its uncertain effect on reining in foreign buyers, my reluctance to embrace the ABSD hikes as a means of improving market conditions is 1) ABSD represents an additional cost, which will be factored in when owners eventually look to sell their property later down the road. That is, we have introduced an additional factor of cost inflation, exacerbating the trend for rising property prices. 2) the prospect of having to pay ABSD on their replacement property has caused many sellers to pull their homes off the market or increase their asking prices to factor in their increased replacement cost, reducing the supply of resale homes available on the market, and making those available pricier. This leaves first-time home buyers with fewer resale options, which are generally the cheaper alternative as opposed to new launches within the same locality. Neither prospect seems to favour the first-time home buyer struggling to keep up with escalating prices. I suppose the punitive stamp duty method is attractive to the authorities given that even in the event it fails, it goes a good way towards lining the country’s coffers (If you recall, the Straits Times reported on 24 September 2012 that cooling measures introduced on 8 December 2011 raked in a cool half billion dollars in revenue within 9 months!) But if the aim is to improve the situation for Singaporean first-time home buyers, I’m doubtful as to the efficacy of this trend of introducing increasingly onerous seller stamp duties and additional buyer stamp duties. When money continues to pour into property despite 6 rounds of punitive stamp duties and tightening loan restrictions, one questions whether a different tact should be adopted instead. My proposition is that the growing rift between affordability and rising property prices is caused by a growing wealth gap. The wealthy who can afford to will continue to park funds into property, much in the same way that a millionaire will continue to strive for higher earnings despite facing a higher income tax rate than his more lowly paid compatriot. Those who cannot afford to will be forced to rent, further enhancing a wealthy landlord’s holding power. My concern is that these monetary barriers (ABSD/SSD/tighter financing) are further polarizing the divergence between those who can and those who cannot afford property in Singapore. If we are sincere about keeping things affordable for the first-time home buyer, rather than tax those that can afford to pay (who will subsequently seek to pass on their additional costs to the next buyer), we should look into giving priority to the ones we seek to help. In Australia, this is done by stipulating that foreigners are only allowed to buy direct from developers, and can only sell on to Australian citizens. 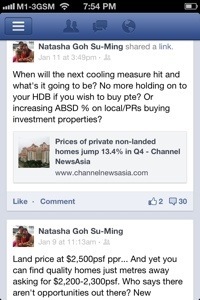 As to the all-important question on people’s minds, will property prices drop in 2013 in the face of these new measures? My take is no, while the volume of transactions will drop significantly, prices will remain firm barring a major catastrophe of Lehman-crisis proportions. I also expect to see slight improvement in rental figures given that some home buyers will be putting off their purchases, and PRs are no longer permitted to rent out their whole HDB flats.